Charles Herman was born on 27 March 1920 in Arthurville, Oklahoma. His father, David Herman, was a butcher, but did other jobs during the Depression years. His mother, Josephine Jesse Smith was a fulltime homemaker. At a young age, his family moved to Canyon City, Colorado, where Charles was raised. After graduating from Canyon City High, Charles moved to Los Angeles and found work with the Lockheed Corporation of Burbank, California, an aircraft plant manufacturing P-38s and Hudson bombers used mainly by the Royal and Canadian Royal Air Forces. When drafted into the Army, his work experience helped to qualify him for aircraft mechanic training. Charles was inducted in Los Angeles, California, during February 1943. He was first sent to Miami Beach, Florida, for Basic training. From there he went to Gunnery school in Harlingen, Texas. Afterwards, he continued his training at the Aircraft Mechanic School in Biloxi, Mississippi. His certification as both an aircraft mechanic and an aerial gunner qualified him to become a Flight Engineer for a bomber crew. 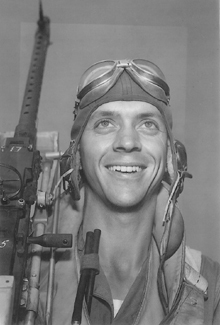 His next stop was to Salt Lake City, Utah, to await his combat crew assignment. While there, he met and fell in love with his future wife, Mary Mills, a nursing student from Vernal, Utah. Charles was assigned to the Fisher Crew and sent to Biggs Field outside El Paso, Texas, for combat crew training. In March of 1944, the crew received their orders to join the 492nd Bomb Group already in training at Alamogordo, New Mexico. Charles was shot down with his crew on 19 May 44 while flying their third mission. Their plane became crippled from an attack by the Luftwaffe near the target in Brunswick, Germany. The crew managed to get back as far as Holland, but then determined the plane could not make it across the Channel. They bailed out over enemy-held territory. His complete mission record and some of the details are recorded on the Fisher Crew 805 page. His own story was recorded by his children. See links at right. After getting captured, Charles spent nearly a year as a POW assigned to Stalag Luft IV. He was able to send and receive mail, thus allowing his courtship with Mary to flourish. In January of 1945, the prisoners of Stalag Luft IV were forced to leave camp under guard. With no destination in mind whatsoever, they were marched about aimlessly through the German countryside until the end of the war some three months later. This became known as a Death March, since many did not survive. They marched until 11 May 45 when they happened upon two English soldiers. It was then the prisoners and guards first learned that Hitler was dead and the German Army had surrendered. It was left up to Charles and his fellow POWs to find their way to a US camp on their own to be processed to be sent home. Immediately after getting home, Charles married his romantic pen pal, Mary, on 27 June 1945. Returning to active service, he was stationed at Peterson Field in Colorado Springs, Colorado, where he worked as an AAF Supply Technician. He was discharged from service toward the end of the year on 3 December at the rank of T/Sgt. With no prior plans made for the future, Charles accepted a partnership with his new father-in-law, who owned and operated a farm and ranch outside Vernal, Utah. Mary worked a full career as a Registered Nurse. Together they raised a good, solid family and lived happily on their farm for years. Charles L Herman died on January 4, 2008.